Follow the geomagnetic development in real time! (NB! Absolute values are shown in the graphs. The data is not yet processed and may contain man-made signals. Real values in processed data (latest processed data 2019-03-31 23:59:59). Solar quiet curves shows the normal or quiet state for the magnetic field when not disturbed by solar storms. The development of quiet curves from 1978 can be seen here: Quiet curves 1978-). http://www2.irf.se/maggraphs/rt1hour.txt gives you data for the last hour with times in hours and the three components (XYZ) in nT as preliminary deflections from the expected monthly mean. http://www2.irf.se/maggraphs/rt_iaga_last_hour.txt gives data in iaga format for the last hour in 1 minute resolution. Absolute values are presented based on absolute measurements made until 2019-04-23 07:37:26.
http://www2.irf.se/maggraphs/rt_iaga_last_hour_1sec.txt gives data in iaga format for the last hour in 1 second resolution. 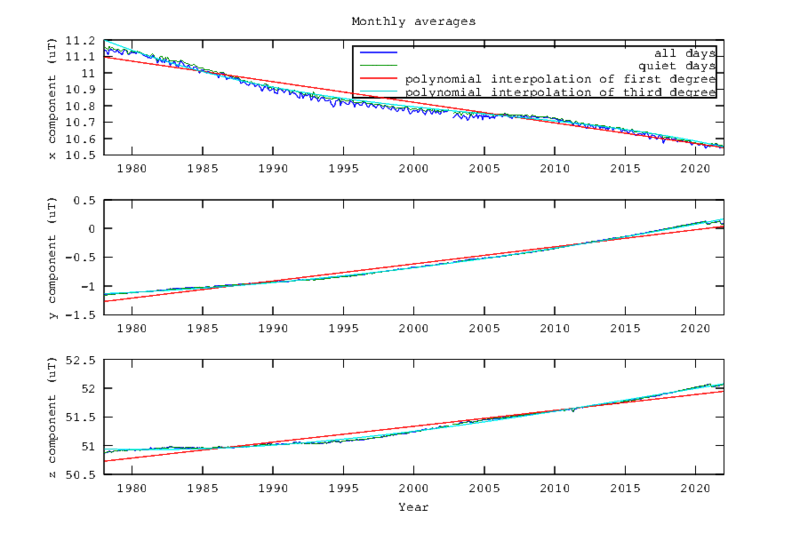 Absolute values are presented based on absolute measurements made until 2019-04-23 07:37:26.
http://www2.irf.se/maggraphs/rt.txt gives ascii data for the last day in the format "yyyymmddhhmmss X Y Z" in nT as preliminary deflections from the expected monthly mean. http://www2.irf.se/maggraphs/rt_eda.txt gives ascii variometer data for the last day in the format "yyyymmddhhmmss X Y Z" in nT for the backup (eda) magnetometer. http://www2.irf.se/maggraphs/rt_iaga.txt gives data in iaga format for the last day. Absolute values are presented based on absolute measurements made until 2019-04-23 07:37:26.
http://www2.irf.se/maggraphs/rt_iaga_eda.txt gives data in iaga format for the last day for backup magnetometer (Eda). http://www2.irf.se/maggraphs/rt_iaga_1sec.txt gives data in iaga format for the last day. Absolute values are presented based on absolute measurements made until 2019-04-23 07:37:26.
http://www2.irf.se/maggraphs/rt_iaga_1sec_eda.txt gives data in iaga format for the last day for backup magnetometer (Eda).